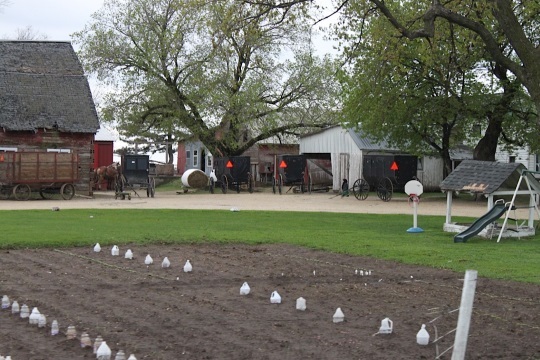 Suzanne Woods Fisher took a trip to the Amish community in Buchanan County, Iowa earlier this year. She shares that visit with us today–along with a few surprises she encountered. The next time you have an occasion to travel to an off-the-beaten path Amish settlement, carve out a little extra time. Slow down and take a moment to look, really look, at the sprawling farmhouses that dot the two-lane roads. Stop at the small general stores that you’ll see handwritten signs for and meet some Amish store clerks. 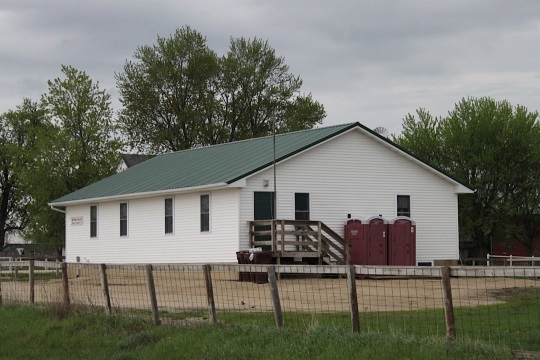 Notice what’s different about the little one-room schoolhouses that are tucked into a corner of a farmer’s field. Suddenly, you’re in another world. One that is markedly different from the major Amish tourist communities. Take, for example, the Amish of Buchanan County, Iowa. I was sitting in the kitchen of a large friendly Amish family in Independence, Iowa, enjoying a cup of coffee and lively conversation about the history of their community. After our visit ended, I took my empty coffee mug to the sink. But there was no sink! Just a long countertop. The reason? They had no indoor plumbing. They don’t want it. The first Amish church in Buchanan County began in 1914, a migration from southern Iowa churches with liberal leanings. It was founded as an effort to protect conservative standards. That frame of mind has certainly infused and shaped the entire settlement. They hold tight to traditions here. This area, stretching from Independence, Fairbank, Hazelton, Jesup, Oelwein, is made up of seven churches in an area of about seven square miles and is considered to be one of the most conservative Amish communities in the country. They use very limited technology: no pneumatic tools, no tractors (permitted with steel wheels in Kalona), no chainsaws. And as I discovered, there was no running water in the homes. They use a hand pump to get water from a well and bring what’s needed into the house. No flush toilets, no bath tubs. Bicycles aren’t permitted here as they are in most of Ohio and Indiana, nor were there any Lancaster-style scooters. Even a woman’s prayer covering seemed more modest than most. It’s made of a thin organza, like the Lancaster Amish, but this covering goes nearly to a woman’s hairline—two fingers distance—and covers her ears. 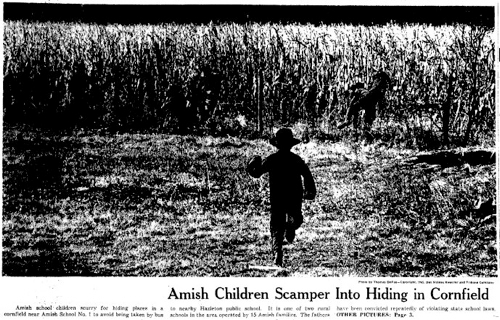 Do you remember the famous 1960s photo of young Amish schoolboys, running into a cornfield to escape the truant officer? That took place in Buchanan County. These Amish Iowans found themselves on the forefront of education disputes that led all the way up to the 1972 U.S. Supreme Court ruling that allowed Amish the right to educate their children up to grade eight, in their own parochial schools. Here’s what I find endlessly fascinating about studying the Amish: Just when you think you’re starting to understand them, they surprise you. One Iowa Amish couple told me about their most recent trip. 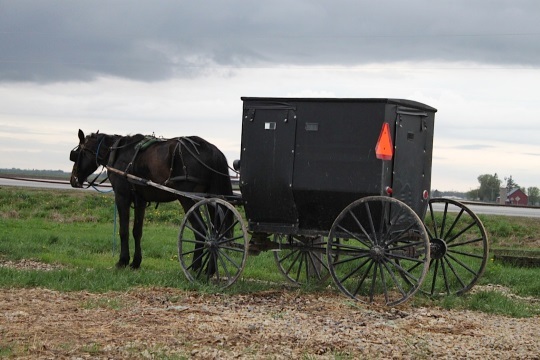 Now, most all Amish love to travel. In fact, the husband had traveled to all fifty states. And the Amish love nature. So if they go to California, it’s to see Yosemite and the Giant Redwoods–not Disneyland or the Golden Gate Bridge. So this Amish couple, who were in their 70s, parents of ten, grandparents of umpteen children, who live in the most conservative Old Order Amish community, had just returned from…(are you sitting down? )…a Princess Cruise to Alaska. Suzanne Woods Fisher is the bestselling, award winning author of fiction and non-fiction books about the Old Order Amish for Revell Books and host of the radio-show-turned-blog Amish Wisdom. Her interest in the Amish began with her grandfather, who was raised Plain. You can find Suzanne on-line at suzannewoodsfisher.com and facebook.com/SuzanneWoodsFisherAuthor. She loves to hear from readers! Enjoyed the mini-tour this morning. Work &amp; play, never dull! I’ve met Suzanne (she did a program for us at my library earlier this year), and am impressed with how much research she does prior to writing her fiction & non-fiction books. It seems to be an ideal job, since it’s work (research & writing, work she’s chosen for herself) but also so enjoyable (meeting with, eating with the Amish in their homes & businesses) that it almost seems like a “play-cation” (if you know what I mean). I found it interesting that this Iowa group (founded 100 years ago! )has stuck to its conservative leanings and thrived all this time, into the 21st century. Visiting there sounds like an adventure in time travel! I’d love to hear more about them…worked into another book of fiction or non-fiction, Suzanne? I’ll surely read it! The Buchanan Co. Amish are somewhat of an in-between group, neither the most conservative nor the least conservative. If I remember correctly, it was John Hostetler’s ‘Amish Society’ which originally hoisted the label ‘one of the most conservative settlements in North America’ over the Buchanan Co settlement. But they are neither Swartzentrubers nor among the most traditional of the Adams County (IN) or Nebraska types. And it might come as a surprise to many that they aren’t even Andy Weavers. They have been excluded by most conservative Amish groups because of their openness to technological change. So they are presently stuck somewhere between the Dan/Andy Weaver Amish and the Lancaster (Streng Meidung but technologically progressive) type, lacking the intricate ties of fellowship that link places like Lawrence Co. (PA) and Fredericktown (OH) to many other settlements. But for someone who hangs out in Lancaster County most of the time, a visit to Buchanan County would seem like a step back in time. Nevertheless, I think the Swartzentrubers would be displeased that someone else is crowding their most cherished claim to fame–being the most conservative among all Amish groups. ‘How could they attain such notoriety with those gaudy SMV emblems stuck on the back of their carriages?’ they might want to know. I can tell you what I use the jugs for—early in the season, (it looks like that’s when this photo was taken), when you put out transplants (seedlings) they’re vulnerable to killing frost overnight, and the plastic bottles (with bottoms cut off, and caps removed) can be placed over the plants for frost protection (but should removed once the temp goes up during the day, or else you’ll BAKE them to death! I’m sure there are many other uses for the jugs, but that’s what I’ve used them for in my tiny garden. Thank you Mary Alice. That makes sense and very creative too. 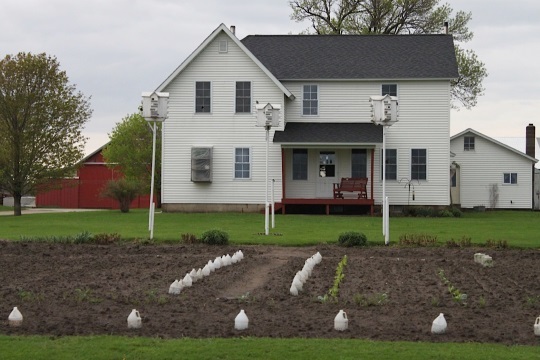 I always enjoy posts about the Buchanan County settlement for it was in that settlement that I first became interested in Amish life. One of my uncles farmed in the Hazleton area next to an Amish farm and I well remember the picture you included of the Amish children running into the cornfield. When I last visited the settlement about ten years ago, I was surprised to see American flgas flying on flagpoles outside of several schoohouses, since most Amish do not pledge allegiance to the flag. One question I had — is the settlement only seven square miles? I am familiar with all of the towns listed and it seems like the settlement is much larger than seven square miles. Seventy square miles would seem to be more like the size of it. On the flags on flagpoles, I would guess based on Suzanne’s description that this might have something to do with the special school arrangement here, with the state providing funding? Maybe someone who knows the situation better can confirm. Interesting observation. Good question about the area of the community. An average of one square mile per church district seems very small, unless they are very dense, but you usually don’t see that size or smaller except in districts in the centers of large communities or districts based around small towns with a number of residents living within town. So it would seem especially dense to have a seven district settlement only taking up seven square miles. Maybe a digit got dropped somewhere. I suppose it’s impolite to even ask. But if more modern technology is so wrong to this group , then how is it OK to have PLASTIC bottles? Perhaps what is happening here, as Mark seems to be hinting at, is that words mean different things to different people. In fact, we often use the same word in different ways within the same conversation. And I wonder how often people realize when this happens. This is part of the problem I have with Evangelical theologians who employ ‘post-modern’ language in an attempt to ‘reach’ a post-modern readership but want readers to pack this post-modern language with fundamentalist meaning. That is, meanings get all tangled up. It is difficult to know exactly what they are trying to say. As Mark pointed out, the Amish are not opposed to ‘modern’ technology as though it is a clear-cut category–for example, refusing to allow anything that was invented after a certain cut-off day (say 1850) or because of some other clearly-defined fundamental quality of a technology (such as whether it can be made without the use of electric, computer-automated tools). Instead, the Amish selectively adopt technology to achieve desired goals. Because authors need to have a clear and simple thesis, they frequently conclude an essay or article with an easy-to-grasp summary such as ‘these people spurn modern technology.’ And I repeatedly hear people talk like this. I think this is just the easiest way to summarize what it seems is happening in Buchanan County when compared to places like Lancaster County or northern Indiana. And when we go from the complex situation on the ground to the author’s summary of ‘rejecting modern technology,’ and then the reader takes their own definition of ‘modern’ in hand and re-translates the ‘rejecting modern technology’ back so as to figure out what to anticipate from a group like this, things often get a bit turned around. And the word ‘modern’ is a loaded word. Entire books are written about this six-letter word, and that without setting the word ‘technology’ next to it. I’d agree with Jonathan. The Buchanan Co. Amish, who have numerous daughter settlements in other states and Ont. are far from the most conservative. The SMV triangles, storm-fronts, etc. put them way ahead of other groups, as would their use of pressure-lights, etc. Though I don’t know for 100% certain, I’m guessing the brakes on the buggy are cable brakes which look like drum brakes but work with a cable rather than hydraulics. The Dan church here in Holmes Co. uses those. Carol, what technology is used in any group is selective. It’s not like there was a cut off point… Things that are not accepted are usually not accepted because of the cultural or spiritual impact it could have, not just because it’s modern. I have been corrected — both hydraulic & cable brakes are “drum brakes.” I’m sorry for the mistake. Does anyone know how much this group has changed over the past, say 10-20 years? Of the significant Amish groups for various reasons I think Swartzentruber Amish have a good claim to being the most conservative. However, in Living Without Electricity (1999 revised edition), Stephen Scott and Kenneth Pellman list 19 different affiliations/settlements in a chart showing which technologies are accepted by which group. Of the 19, Buchanan County is among the 3 or 4 most restrictive, accepting only 2 of 15 technologies listed (pressurized lamps/lanterns and motorized washing machines, estimated by the authors to be accepted by 90% and 97% of all Amish, respectively). Only the Swartzentrubers accept fewer of the 15 (just motorized washing machines, and pneumatic tool acceptance in some districts–again, this is a 1999 copyright, and they also do not list anything related to buggies). Materially, going by the above and other photos I have seen, Buchanan County doesn’t appear nearly as low as Swartzentrubers or some Swiss churches. Granted, these are just 15 technologies and this doesn’t take into account other factors like worldview and religious practice, but this information seems to suggest that they do restrict quite a bit of technology. I just now realized that my editor’s eye overlooked the wording of the final sentence of the post, and going back in time I’d suggest altering it to not grant them the superlative most conservative title. I’ve never visited this settlement myself, and so this is also why I am wondering if they have experienced significant change since this information was compiled. Buchanan County had not permitted storm fronts. I noticed that one of the buggies in the picture seems to have a storm front. I also understand that Buchanan County permitted battery tools as an alternative to thin, flexible lineshaft-driven tools and pneumatic tools. In other words, this document is saying it is not permitted to have a phone, especially not in the house, but also not in a small house/cabin/shanty along the road. But if someone from a more liberal church has one then it is permitted to use one of those phones as long as it is done in moderation and the neighbor is paid fairly for its use. I expect there are several other things that Buchanan County has allowed (though I must say my above comments are only based on what I have heard from people who have lived there or have relatives there and thus should be considered tentative suggestions) which has caused them to be fully accepted by the Andy Weavers. But if they have tolerated battery tools for some time and permitted phone shanties, that is enough to put them outside the fences, even if they are quite conservative in other areas. Thanks for the outstanding posts on this community Johnathan; very good insight. I don’t think I have ever visited AA that I didn’t learn something new. Same thing this time, just a lot more detail. Clearly, you know this subject. Thanks again. I live in Buchanan County and my wife grew up on a gravel road with both Amish and English houses. We rented her childhood home for a short while after we were married and I do miss the sound of buggies going by every day. I have a number of Amish friends and I may be able to provide some insight into the evolution of this community. Last year was a big year as they approved two big changes. Windshields on the buggies and mechanical corn pickers are now allowed. As for other things of note, I am rather certain that they allow chainsaws (I know for a fact that they have gas weed trimmers). Many have converted old propane tanks to hold compressed air used to power fans in their businesses and barns and to pump water, but I am not sure to what extent pneumatic tools are used otherwise. I know one of my friends was using a cordless drill to put siding on a shed at his house last time I saw him. My father in law is a van driver for an amish construction crew as well as general transportation for many in the community so if you have any specific questions I could ask him. He has learned a lot from his passengers. It seems when all the comments are put together–Suzanne Woods Fisher’s interesting essay, Don Burke’s observation that the Amish can be challenging to describe, Alice Mary’s explanation of the use of the white jugs, Al’s suggestion about the size of the community, Carol’s question about how Buchanan County Amish can spurn modernity and yet take advantage of a product of modernity, Mark’s observation about cable brakes, Erik’s knowledge of texts which shed light on technology use in different communities, Jean Junkin’s personal experience with the Buchanan County Amish, and Carl Oliver’s local knowledge–this has become a well-rounded thread. I agree J.E., a lot of nice additions to this post. I have certainly learned something about this community–at the least that it has undergone some recent changes given Carl’s comments. Thank you Carl for fleshing this out with local knowledge. And I’m glad for Suzanne getting the ball rolling with her initial post. Thanks for running this site Erik! I love it. One other thing I forgot to mention is phones. They do have phone shacks on a few main corners. Two that I know of are each located right next to a school. Also, some who are in charge of a construction crew will give out a cell number on their business card. Usually this number is their van driver’s number and they return calls on the way to and from the job site. I did know of one man who had a cell phone on him at all times on the construction site, but he had to leave the phone with his van driver every night when he went home. We have made a wonderful friendship with an amish couple. The husband is the bishop of their district. We visited with them this summer, and were made to feel so welcome. We had our two teenage granddaughters with us, and Roy and Elsie just fell in love with the girls. We have been talking back and forth, my home phone to the phone she shares with others in a phone shack. I knew Elsie was having knee replacement done last week, and she wouldn’t be able to call so we said we would write for the colder weather until it gets warmer. I couldn’t believe who called me yesterday. As I said Roy is the bishop and he called to let me know how Elsie is doing. We spoke for quite a while. We always find things to talk about that interest both of us. He also asked how our two granddaughters. He said they are the nicest English girls he has ever met. This was so wonderful for Roy, the Bishop, to call me. He’s going to call me again, and keep me updated on Elsie. Our family is truly blessed to have Roy and Elsie in our lives. I love Suzanne Woods Fisher books and always look forward to her next novel.. Hope another is in the works soon! 🙂 Enjoyed the article & photos too.. Regarding the plastic jugs.. they are called Hot Caps.. and are used all over the US.. I was introduced to them in the late 70s and they are indeed a great way to get your veggies (especially tomatoes) out early without fear of a frost killing them. There are many variations of Hot Caps but this one is the cheapest & probably the most commonly used. Enjoyed everyone’s comments.. and I love that there are so many folks here that have first-hand knowledge and share it.. Thanks to all! I was thinking… when Suzanne (or any other author) is actually in an Amish home doing research for a book… does she actually ask if she could take a picture of their home/kitchen/house/buggy? I was just wondering at what juncture a person would ask if they could take pictures of the inside of someones home… If perhaps you were friends.. not mere acquaintances… or if you are a writer & someone has agreed to help you with research on Amish… etc..
I’ve been inside several of our farmers Amish homes, and taken photos of some of the farms but I’ve never asked to take photos of the inside of their homes. btw… Im not alluding to the fact that I want to take photos of their homes… Just a thought regarding whether or not authors might ask to. I’m late to the party! Have been traveling over the Christmas holidays and am just getting home now. Thank you, everyone, for your insights, comments, thoughts, additional info. I learned more after reading through them! Kim H.–about asking to take a photo in an Amish home–I think it depends on how comfortable you are with your Amish acquaintances. I had just met this family in Buchanan County and was just grateful to be in their home. Wouldn’t dare ask to take a pix!